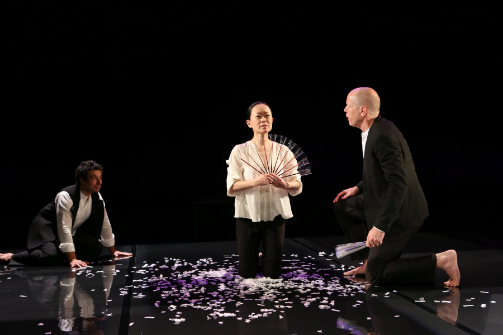 Akiko Aizawa, Gian-Murray Gianino, and Stephen Duff Webber in Hanjo. Photo by Julie Lemberger. BOTTOM LINE: Modern Noh theater gets a slick new treatment from SITI Company, intentionally losing us in translation. Hanjo is a reworking of a reworking of a reworking. From the Chinese writer Ban, of the Han Dynasty, comes the “Verse of Resentment.” Motokiyo Zeami reworks the poem into a Noh play; Yukio Mishima updates the work for a modern audience along with other text lying dormant in the vaults of classical Japanese Noh theater. There’s a further layer in an English translation here by director Leon Ingulsrud and staged elegantly by SITI Company in the immaculate Japan Society. But Ingulsrud has another plan up his sleeve: he switches the casting and now an English-speaking actor takes on the Hanako role. We get the other half of the conversation in all of its depressing and beautiful glory. It so happens that the man who has come for Hanako is not the man she been waiting for for all these years. In a kind of Cinderella story: the fan does not fit. The scene plays once more, for the third and final time, it is performed by the actors switching roles again, filling in additional dialogue with the English translation and maintaining the rich gestural language of Noh theater. I wondered if indeed this was not the right man. I wondered also a more intriguing question: if the thing we are waiting for comes, how will we know? What if the thing we have been waiting for never comes? Or what if we do not understand this precious thing in the same context? Is it worth it to wait? The work is beautiful. Perhaps it is right that a play about a long wait feels maddeningly tedious. By the third revolve, we really do get ahead of Hanjo in a way that doesn’t feel useful. For an audience to see the story three times, we beg for something different to be offered on the last go-round. A realization? A final goodbye? Hanjo leaves audiences waiting. Hanjo is by Yukio Mishima. Translated and directed by Leon Ingulsrud. Scenic and Lighting Design by Brian H. Scott. Costume Design by Mariko Ohigashi. Sound Design and Original Compositions by Christian Frederickson. Production Stage Manager is Ellen Mezzera. The cast is Akiko Aizawa, Gian-Murray Gianino, and Stephen Duff Webber with Christian Frederickson on the violin.